Wedding season is fast approaching and many recently engaged couples will soon be scrambling to find the perfect venue, florists, caterers, and musicians. It’s an overwhelming process for sure, but the key to success is start early with your planning before every vendor on your list gets booked up. Western North Carolina offers a ton of resources for bride and grooms-to-be. Here are the top ways to start your wedding planning in the Blue Ridge. Burnsville is a popular spot for wedding ceremonies and receptions for local residents and those planning destination weddings. Surrounded by the highest mountain peaks east of the Mississippi it’s no wonder people are clamoring for the picturesque venues located throughout this area. The Burnsville Wedding Expo invites brides-to-be, their fiancés, family and friends to meet local vendors and explore area options for WNC weddings. The expo, now in its fourth year, takes place at Burnsville Town Center on Saturday, Feb. 16. New this year is a fashion show presented by David’s Bridal. Models hit the runway to show off some of the latest styles in wedding gowns, as well as bridesmaid dresses, menswear, and children’s clothing for flower girls and ring bearers. A favorite expo tradition returns with brides digging through a tiered cake to find a wedding band hidden inside. The lucky participant who uncovers the ring gets to keep it. The expo showcases approximately 35 vendors including venues, planners, dress shops, menswear retailers, florists, stationers, caterers, jewelers, photographers, videographers, DJs, transportation companies and more. Nu Ray Inn: This historic inn in Town Center offers a ton of charm and you can rent out the entire place for your wedding. It’s convenient to all the downtown offerings in Burnsville. Hendersonville is a popular choice for local brides, as well as brides planning destination weddings. 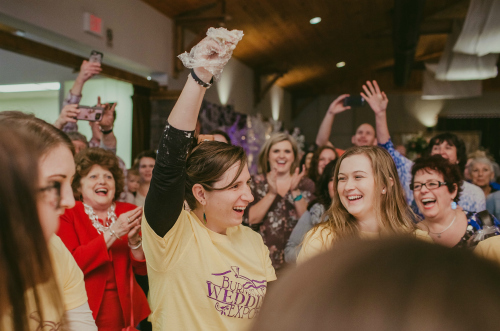 The area’s natural beauty, variety of venues and myriad businesses that support the wedding industry all contribute to Hendersonville’s popularity. They’re hosting a bridal show in March at the Blue Ride Community College Conference Center. The show features vendors from all facets of the wedding world, such as venues, caterers, photographers, videographers, fashion retailers, florists, bakeries, DJs, planners, hairdressers, makeup artists and more. There are 65 venues in Henderson County to accommodate weddings of all sizes and styles. Intimate spaces, such as bed-and-breakfast inns, gardens and historic buildings, are ideal for smaller weddings. While several scenic wineries, renovated barns, church sanctuaries, hotel ballrooms and rustic outdoor settings allow for large celebrations. The bridal show gives couples an opportunity to meet vendors in person, ask questions and sample their products. 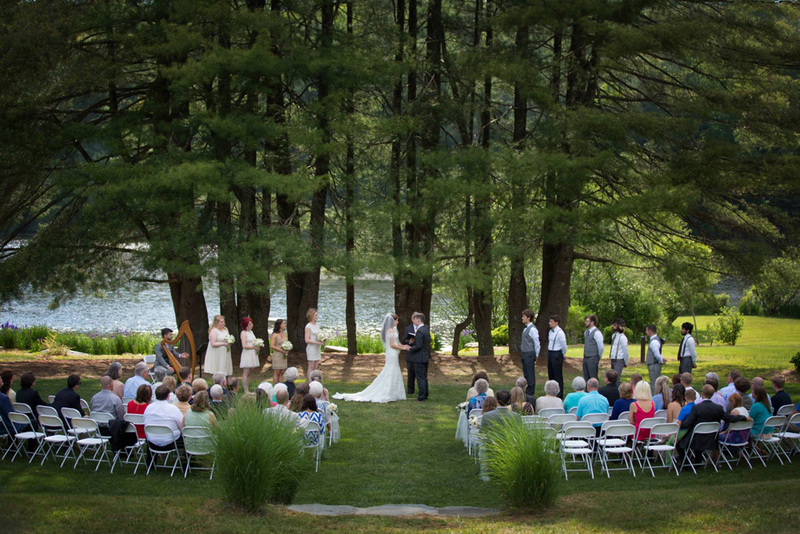 Highland Lake Inn & Resort: Located on 26 wonderful country acres on a lake in Historic Flat Rock, NC, this resort provides a beautiful location for your wedding with multiple lodgings, meeting halls and venues, and superb dining from the award-winning team at Season’s restaurant. Kanuga Conference and Retreat Center: Located on a peaceful 1,400-acre campus, Kanuga offers a lakeside retreat. A memorable setting for any wedding. Mike’s on Main: Perfect for a wedding shower, or events up to 50 people, Mike’s in downtown Hendersonville has a private room upstairs from their 1950s style restaurant. Want to get married in Asheville? Sure you do. It offers the scenic mountain backdrop you’re looking for, and offers tons of activities for the wedding party around town. You’ll find a number of unique venues throughout town that will set your wedding apart from any other you’ve attended. Need some help? Check with the folks at Explore Asheville. They’ll do the heavy lifting when it comes to finding you great rates for host hotels. Better yet – it’s free! 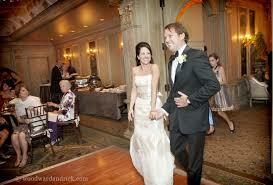 If you’re looking to do something small, then Destination Elopements are a great choice. They specialize in micro-weddings and can give you the special day you want, without all the fuss. Biltmore – The stunning winter chateaux of George W Vanderbilt offers a variety of event spaces for any size group. Highland Brewing Company & Event Center – Share in the revelry at the place that started Asheville’s booming beer scene. North Carolina Arboretum: This 434-acre public garden will have you saying your vows surrounded by beautifully cultivated gardens. Here’s a list of some other special places around the Blue Ridge Mountains that can host wedding experiences and special events. Start by picking which area you’re most interest in and then add these venues to your shortlist of places to check out. – Silver Fork Vineyard & Winery: Spanning 32 total acres, with 5 acres of grape vines, rolling hills, wooded trees and 2 winding creeks, this winery is a beautiful and scenic event location. – Events at Mountain Magnolia Inn: Tie the knot beneath their ancient walnut tree, and make yourself at home in a fully restored Victorian Inn with family and friends. This wedding destination venue offers full service catering from their onsite restaurant and personalized wedding coordination. Historic Carson House Museum & The Jubilee Arbor Event: This historic home has been refurbished and is now a private museum. Event space includes a large outdoor pavilion with a fireplace. Springmaid Mountain: A secluded 400-acre retreat located on the North Toe River, offers visitors peace, quiet and tranquility. 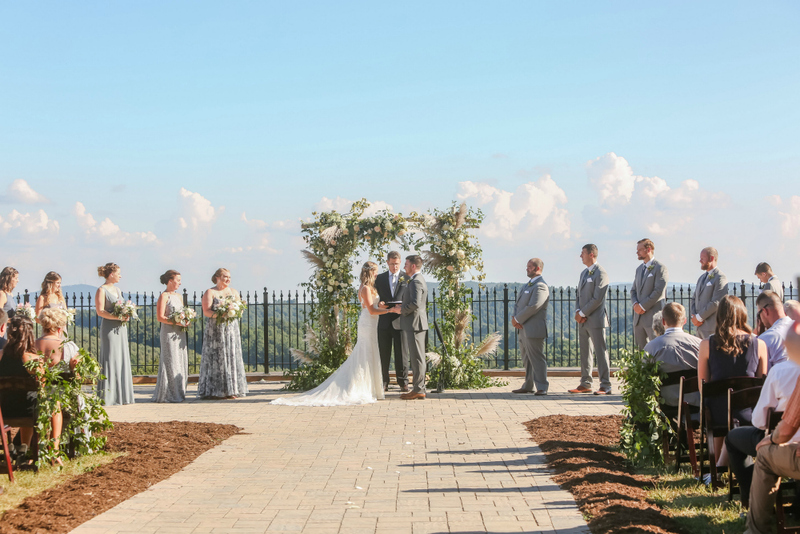 As a popular destination for weddings, many couples choose to have their wedding ceremony and reception at the Pavilion, on a grassy slope or on the grounds of the Saddle Ridge Overlook Cabin, where the natural backdrop is simply breathtaking. Tryon Fine Arts Center: Whether you need a large space indoors, or prefer a scenic outdoor space, the TFAC can provide AV equipment, reception space in their gallery, and a catering kitchen. Defiant Whisky: What better place for a bachelor getaway event, than one of the Blue Ridge Mountains top whisky distilleries. Located in the Golden Valley, they produce some of the best single malt whisky in the mountains. Events by Copper Penny: This popular restaurant in Forest City has event space that can host up to 120 people. Rumbling Bald Resort: – Surrounded by the towering cliffs of Rumbling Bald Mountain, this 3,000+ acre property is home to a private white sand beach, children’s water park, distinct dining experiences and numerous hiking and biking trails, all tailored for relaxation in an authentic mountain getaway. They have a covered reception facility and a lakeside gazebo. 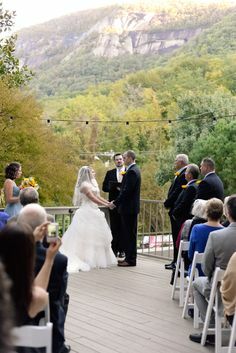 The Esmerelda Inn, Cabins & Restaurants: This Inn offers a truly serene location for Chimney Rock & Lake Lure wedding, receptions, and rehearsal dinners. Plus they have cabins, a Jacuzzi and Spa, and site restaurant. Lake Toxaway Country Club: This venue offers breathtaking mountain vistas, crisp summer nights and personalized service. With seating for up to 300 guests, they offer outstanding indoor and outdoor spaces for wedding ceremonies and receptions. Pilot Cove Forest Lodging: This venue just completed their new Amphitheater, which is beautifully carved into the natural landscape of their mountain property. It’s perfect for intimate gatherings such as weddings and receptions.